Christian women, take the dread & obligation out of your workout by bringing God to the center and making exercise an act of worship. Over the course of my 100-pound weight loss journey, I’ve heard all kinds of tips about finding your fitness motivation. Some people recommend keeping a dress you love in a smaller size to motivate you to shed extra pounds. Some surround themselves with pictures of skinny people that they aspire to look like (I really hate that method). 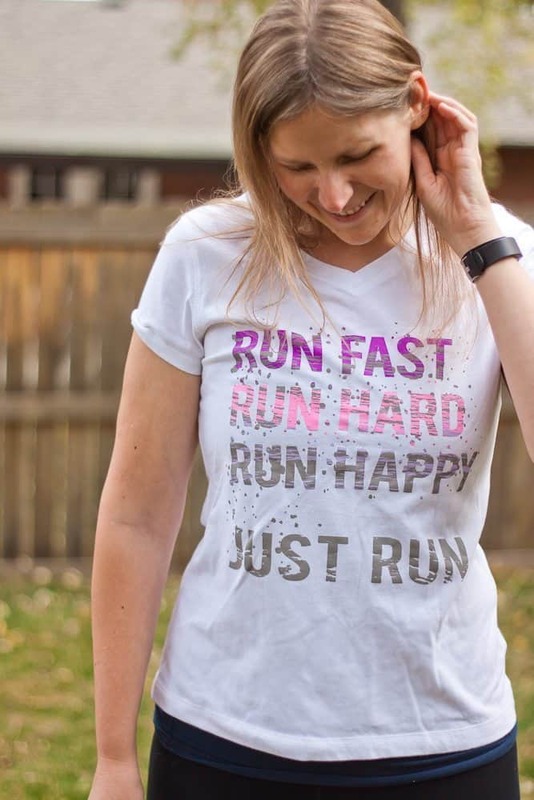 Others find their motivation in Pinterest quotes or buying the newest fitness tracker. I do love my Fitbit, but it’s an extra accessory to my motivation, not the foundation. All of those reasons above are…fine. They will probably work for a while. But the main reason you exercise has to be something you care about greatly because you know how easy it is to avoid it altogether. Willpower only takes you so far and there is never a lack of excuses. That reason you choose has to be big enough to fight through the “I don’t wanna”s, “I don’t feel like it”s, and “I’ll do it tomorrow”s. I don’t know about you, but the promise of a pretty dress isn’t enough to pry me out of a warm bed on a cold morning to go running. But if it’s an opportunity to grow closer to God? The trick is being able to fix your eyes on God and make exercise an act of worship. It’s great if you decide to throw on some worship music or pray while you workout, but that’s not at all required to make exercise an act of worship. It’s all about getting to the attitude of your heart. 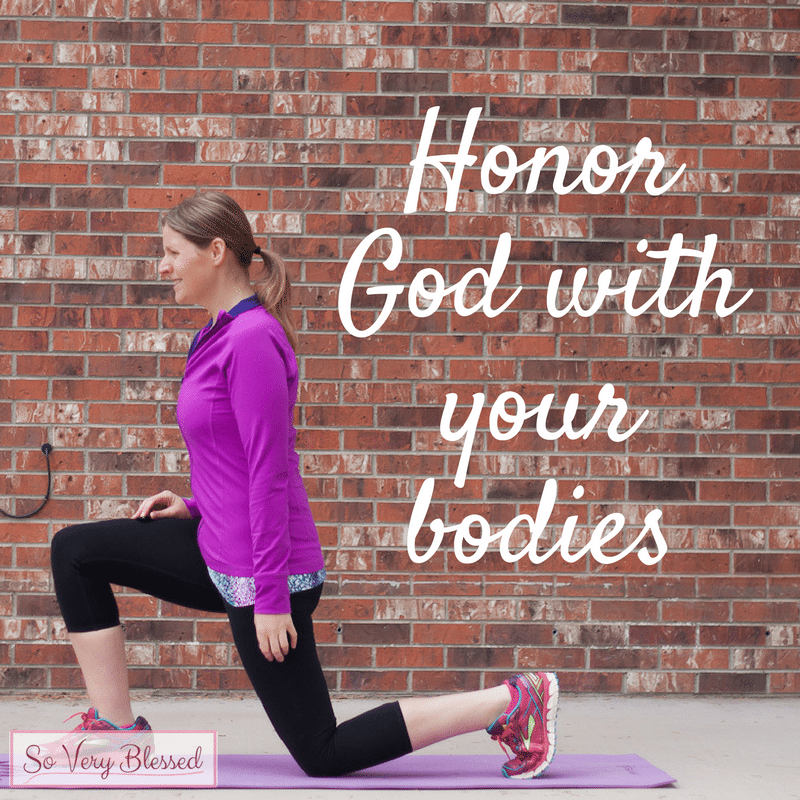 Now, I exercise to glorify God by honoring Him with my body, but that sure wasn’t always the case! I used to exercise to look good, for myself and others. I wanted to get rid of my muffin top, chisel my abs, and firm up that flap that hangs underneath my arms. Most of my motivation came from a place of hating my body the way it was. That is not what God desires for us. He doesn’t function out of hate and He is the Creator of that body you criticize so harshly. Everything He does is out of love, and exercise should come from that place, too – not out of a love for a toned and perfect body, but out of love for Him. Realizing the connection between God and working out shifted exercise from being a dreaded (and constantly procrastinated) chore in my life to an activity that I am actually thankful for (no, really, I mean it!). God created you intentionally and for a purpose and I guarantee it goes far deeper than chiseled abs. To be able to passionately live out that purpose, glorifying Him and serving the people in your life, you need energy and stamina, which only comes from taking care taking care of your body. Your mind, your body, your emotions, and your soul are not isolated from each other. They are all intertwined and if just one is off, all of them are affected. Exercise to draw nearer to God in heart, body, mind, and soul. It is really easy to view exercise as a punishment. It takes a heck of a lot of willpower and it leaves you huffing and puffing and sore afterward. And, for me, I felt like it unveiled all of my flaws. I was never strong enough or fast enough or fit enough (and what is “enough” anyway?). Going to the gym was always an invitation for my insecurities and discontent with my body to flood my thoughts. So, maybe you can’t do certain things. But there are a whole lot of things you can do. Exercise doesn’t have to be a big comparison game. Your body was not made exactly the same as anyone else’s, so is it any surprise that it doesn’t function exactly the same way either? It’s not about how you measure up against others, it’s about doing what you can with the body that you have. Are you thankful for your body? Not the one you wish you had, but the body you have right now, full of scars, stretch marks, blemishes, and imperfections. If you hate your body, you aren’t going to treat it kindly. Exercise is meant to nurture, not abuse. That body of yours that was fearfully and wonderfully made is a gift. Not something to be criticized and punished, but something precious to be nourished, tended, and accepted with a thankful heart. This takes a very intentional shift in your focus. Every time I look in the mirror, I can easily pick out all of the flaws. I would encourage you to start searching for the blessings instead – eyes that see, ears that hear, legs that walk, and fingers that tickle. There is so much to be thankful for, you just have to look for it. Exercise is not about glorifying your body, it’s about glorifying God. My relationships are my top priority in life. My relationship with God, with my family, with friends, with people at church. Those connections matter so much more to me than my how fast I can run a mile. I used to see exercise as wasted time that I could be spent doing other things. What I didn’t realize back then is that exercising affects my relationships, every single one of them! It puts me in a better mood, boosts my energy, and gives me focus to be more productive. And now, I put that exercise time to good use. When I’m running or on the elliptical machine, I no longer feel like it’s wasted time. It’s time I spend listening to praise music, praying, or memorizing Scripture. Or I exercise with people (I love running with my mom to catch up on our weeks) to mix quality time with fitness. Worship is an activity of the heart, and when exercise is focused on our relationship with God, it becomes an act of worship itself. God is not focused on your outward appearance, but He sure does care about your heart. It isn’t about performance or perfection, it’s about relationship. 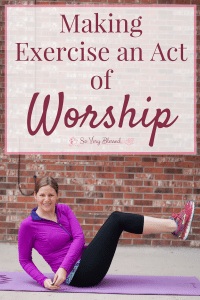 It’s a choice, it’s hard (don’t miss this post on using your weight loss journey as a way to be a living sacrifice), and I don’t always feel like it, but it’s worship – an act of love. So, next time you are trying to muster up the motivation to get up and active, don’t just think about your New Year’s resolutions or that 10 pounds you would love to lose before your cousin’s wedding. Think about your relationship with God. 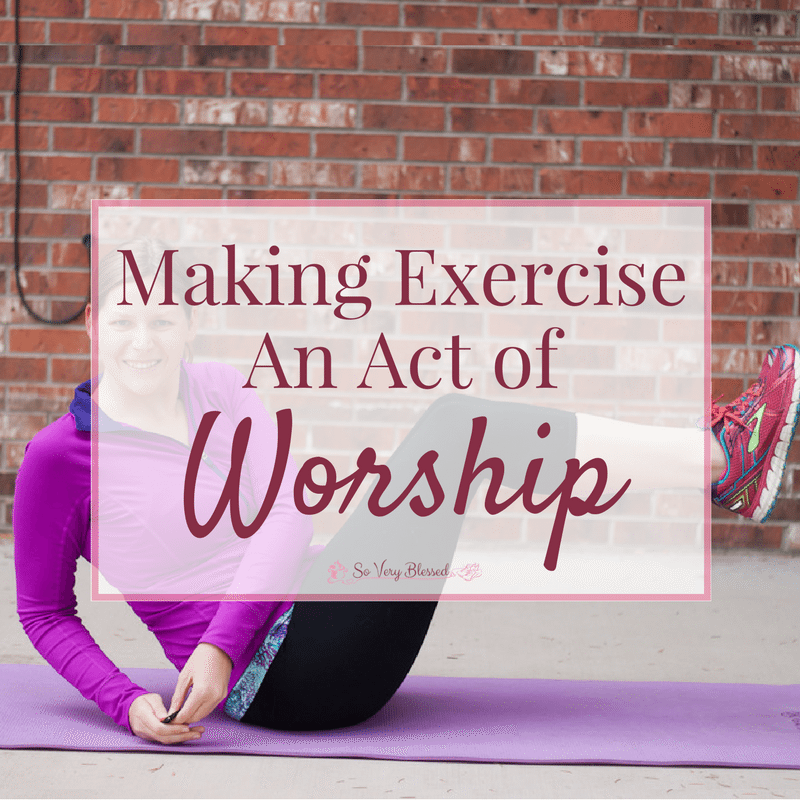 How are you going to make exercise an act of worship in your life? What are some ways you can fix your eyes on God while you workout? I dont know how I “stumbled” on your website but thanking God for the encouraging words. Being a gourmet cook I love serving my family and others. But in the meantime don’t stop eating when I should or binge when I’m tired or stressed etc. I now have health issues and am also trying to be a good caregiver for my son who has a traumatic brain injury. I want so desperately to be able to lose weight so I can move again without pain. I need a right spirit and a clean heart again. I want to please God first! Find myself failing daily. Thank you for your encouraging words from God. I am SOOOO looking forward to receiving Gods message from your lips to my ears. 🙂 I’m praying for you right now that God would fill you and empower you to keep being an encourager of the faith! God bless you my sweet sister in Christ! Oh my! It would definitely be tough as a gourmet cook. So many tempting foods to overindulge in! Especially with the added responsibility of staying healthy to care for your son. I just stopped and said a prayer for you and your son. I love how your heart is desiring God so much and I pray you are able to continue to find ways to meet Him on a deeper level – in your eating, in your exercise, and in every single thing you do! I want to thank you for sharing your journey. I have been emotionally eating for months now due to trying to fill a void. My son moved to Colorado to attend school in June 2018. He got married the previous December so he had already been out of the house for some time. It was just hard to imagine he would be so far away and we are such close-knit family. I also had lost my grandmother, dad, and stepdad back to back from Dec. 2015 to Dec. 2017. Christmas time, needless to say, is not easy and it was the first Christmas he would not be with me in his entire life. I had been praying and realized I was not alone that God was with me. All of the devotions were speaking to me and letting me know things were going to be okay. My son and I talk from time to time and I realized it was time for him to grow as a person and I put him in Godś hands. So now I am on a journey for myself to get closer to God and to take care of me inside and out. I will look at exercise as getting closer to God even if itś just a walk outside. I am so happy I found your website. Hi Tonya! It’s so nice to “meet” you and I’m so glad you’re here. It sounds like you already have a lot of self-awareness there of what’s going on. That is a lot of loss to process through in a short amount of time, so I can only imagine how difficult it was not to have your son nearby anymore on top of everything else. Hi Becky! I just joined the 7 week course and I will tell you that exercising is the most challenging part of self-care. I’m 65, had to retire a couple years ago due to severe degenerative joint disease and have had 4 total joint replacements in just under 2 years. There are so many exercises I can’t do now that I started feeling down about it, thinking “I’ll never be able to……”. I’m loving the idea of setting my own exercise goal so it’ll be something I know that I will be able to do. Thank you so very much for all you are doing. Thank you for your prayers and for working as God’s Agent for Health and Fitness. Hi Chrys! I am so excited to get to know you in the Premium Support group! There is no denying that exercise is tough, especially when you have other health issues preventing you from being able to do a lot of the traditional exercise programs. I’m looking forward to talking to you more and come up with a realistic exercise plan for you! Thank you for writing this. I never thought about using that time to worship Him and draw closer to Him. That makes perfect sense. But I lack on finding things to do to be active. Don’t know if I can afford a gym. Last piece of equipment (a recumbent bike) I had ended up a clothes rack. My schedule is not the same everyday, so even going for walks is not really feasible. Do you have any suggestions for things to do at home that won’t take a lot of time? Yes! 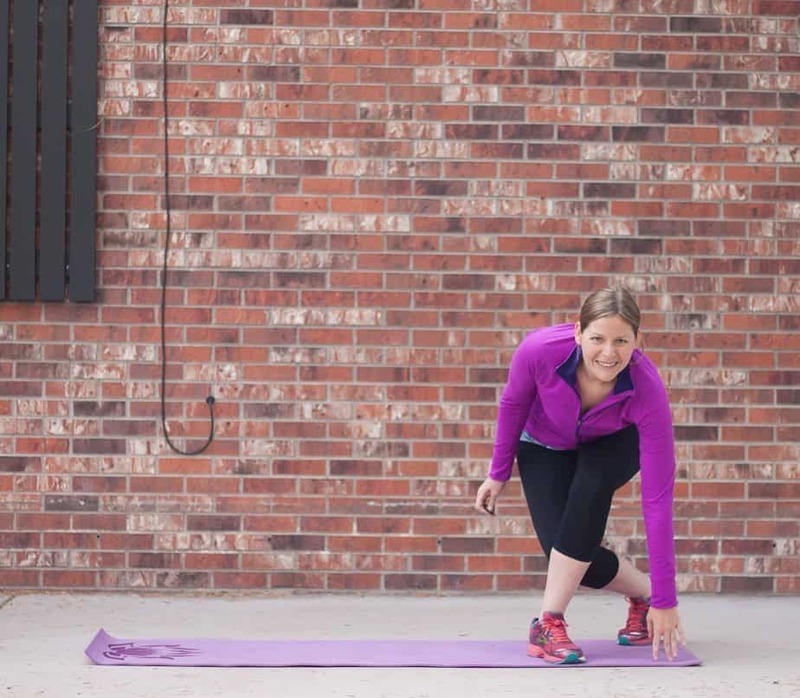 At home workouts that won’t take a lot of time are my favorites! If you’d like to stick with working out at home, then I’d suggest getting some hand weights and possibly a yoga mat if you have a hard floor and need padding for floor exercises. I really like the free videos they have available on Spark People (http://www.sparkpeople.tv/) and there are a TON of free exercise videos on YouTube, as well. I really enjoy the HASFit workouts (http://hasfit.com/?s) and I’ve also been trying some Holy Yoga videos from this channel recently (https://www.youtube.com/channel/UC0n6WQ3_PAePXz_IZzXZFGA). You can also search YouTube for tabata and HIIT workouts for beginners. The one DVD that I have pretty much worn out completely is Jillian Micheal’s 30-Day Shred (https://amzn.to/2GG0Efw) because it’s only 20 minutes long, but it always challenges me. I hope that helps! Becky, What a wonderful message and how inspiring! I’ve been trying to incorporate worshiping the Lord in my everyday life – not just on Sundays or certain times. And I also struggle with weight and getting off this plateau I’m on. So, how perfect and relevant is your message for me! I’m thankful the Lord led me to you! And even though I’m 60+ years young and work full time, I have faith and believe that this is something that I can do and incorporate into my busy and sometimes challenging “mature” life – especially on those days when I feel like staying in bed with my “mature” aching muscles and joints and the heating pad! 🙂 So say a prayer for me and keep your great information and messages of encouragement and support coming! Thank you and God bless you! I will absolutely be saying a prayer for you, Vanette! Thank you so much for your kind comment and I am so excited to hear how you incorporate more worship into your life. A small group I was in at one time talked about how Brother Lawrence would seek God in the most mundane activities of life (like hours of washing dishes) and that has always inspired me to turn every little thing that I can into a worshipful experience. Great post, Becky! Thank you ???? You are so welcome, Barb! I wanted to stop and thank you for your straight-from-the-heart post. I’ve struggled with my weight pretty much all of my adult life. The struggle between a muffin-top and chiseled abs was never really enough motivation for me either. Your thoughts here are helping me to shift my perspective from working out as an act of drudgery to an act of worship. 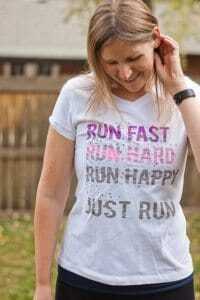 You made such an impact on my thoughts here that I included you and a link back to this article on my most recent post where I talked about the importance of fitness for Christian women. Thanks again! I pray that God continues to use your ministry here to bring glory to Himself. Blessings! Ha! Another Becki, how fun! It’s so nice to “meet” you. And I just stopped by your website. It’s absolutely gorgeous! You’ve created something amazing there! Thank you so much for including me in your post. I am humbled that this post impacted you and I stand behind your message wholeheartedly! And, gosh, I can’t thank you enough for your prayers. That really touches me and they are just invaluable to me. Thank you for taking the time to comment and encourage me today. Praising God for you today! I just stumbled upon this article and absolutely love it! Thank you so much for sharing Truth. Looking forward to reading more of your blogs! Thank you so much for your sweet comment, Hannah! All glory definitely goes to Him! I especially love your point about exercise not being time wasted, but making a positive impact on our relationships. That is something that I’ve struggled to balance (you can certainly go overboard, or at least trick yourself into thinking that you need to kill yourself working out to be a better person), and I see so any others who just can’t get past their belief that exercise is “wasting time” that could be spent on more “worthy” pursuits. Thank you so much, Hannah! Relationships are my number one motivator, for sure, so shifting my focus definitely helped me to feel like I wasn’t wasting time anymore (and I absolutely used to feel that way). “Exercise is meant to nurture not abuse”- love this! Thanks for the good reminder! You are so welcome! That was a pretty important mindset shift for me. That has been the most challenging part for me too, Ailie! Praying for God to show you the depth of the gift He has given you in your body today. This is an awesome mindset! I’ve been trying to work out and lose a few pounds to be healthier. It’s still difficult to get motivated enough to do it. I’ve pinned this for later reference. Thank you. You are so welcome! Seeing that connection really changed everything for me and made the choice to workout so much easier! That is so sweet of you to pin this! Thank you! It haven´t cross my mind to link motivation for workouts with Gott. But it´s a nice idea. Thank you for sharing this point of view! Seeing that connection between God and exercise sure changed everything to me! You are so welcome and thanks for your comment! You wrote: “It’s a choice, it’s hard, and I don’t always feel like it, but it’s worship – an act of love.” After losing 50lbs this year, I can finally move better. More. And sometimes I don’t even when I mean to. Making it part of my worship changes that. It’s not just another thing to check off my to-do list! Congratulations, Joy! Wow, losing 50 pounds is an incredible accomplishment! It’s so easy to resent exercise, chores, and other daily tasks you don’t really love. Making them an act of worship changes your entire outlook for the day! That resentment is so sneaky with those daily tasks! You are right – that attitude applies to dishwashing and vacuuming just as much as exercise! Ha! I love it! Thank you so much for your kind words and I hope you had a worshipful workout session!